Volunteers are needed to drive cancer patients to treatment. One of the biggest roadblocks to cancer treatment can be transportation. 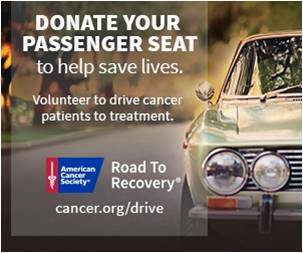 That's why the American Cancer Society Road To Recovery program provides patients with free rides. And we need your help. Because even though our volunteers have driven hundreds of thousands of patients to their cancer treatment - the need continues to grow. You already have one of the most crucial instruments in cancer care. And it's been next to you the whole time ­ your passenger seat. -Sign up and take our training course, which includes a 15 minute, new volunteer orientation video, and a 45 minute, Road to Recovery course. -Complete the volunteer profile. This form collects volunteer information such as hours of availability, and asks for information to complete background checks. -A background check for the prior three-year period. How are ride requests coordinated? Upon completion of the on-boarding process, volunteer drivers will begin to receive ride requests from their Road To Recovery coordinator. -Volunteers will be matched to ride requests based on their profile. -When a driver accepts a ride, they are responsible for confirming with the patient one to two days prior to the ride. -Once a ride request is accepted, it is expected that the volunteer driver will carry out the ride unless an emergency arises. To volunteer in your community or for more information, visit cancer.org/drive, contact your local American Cancer Society office or call 1-800-227-2345.